This week I'm doing a bit of a wellness post. I ended up not posting the SPF video to YouTube last week. You can expect it this monday. My skincare routine is a big part of my morning routine but a lot happens before I head to the bathroom to shower and wash my face in the morning. It's a routine that's constantly changing. However, a few things seem to be fairly consistent - lemon water first thing out of bed and a matcha about 45 mins after that. These two things work together from the inside out to start off my skincare routine. I mentioned this in my recent Colloidal Silver post but I think it's worth repeating. Upon waking, I drink at least one full glass of filtered water with a 1/4 to 1/2 of lemon squeezed into it, depending on the size of the lemon. This obviously is a great way to rehydrate after a full night of not drinking any water (I already get up multiple times during the night so I never add more liquid into the mix or I'd never sleep!). Lemon is a great source of vitamin C, it's antioxidant, it helps create enzymes your liver needs to detoxify your body and can also prevent kidney stones. In addition to lemon, I've started adding in a mineral complex to this morning cocktail. I recently read (who reads anymore?! I listened to it on Audible) Aubrey Marcus's Own Your Day Own Your Life. I definitely recommend this to anyone interested in bio-hacking, personal optimization or just wanting to become a better version of you. I found it really helpful and incredibly interesting! It's full of personal anecdotes that are backed up by scientific studies (totally my jam). Anyway, Aubrey does and suggests a Morning Mineral Cocktail of water, lemon and Himalayan Pink Salt. This helps to remineralize your body and add electrolytes. Pink salt is iron rich and contains tons of essential trace minerals (84 to be exact). These minerals are the teeny tiny building blocks that help your cells function optimally. Aubrey suggests adding 3 grams of pink salt to 12 oz of water. I didn't love how, well, salty it ended up being. So I make a boujee version and add Colloidal Earth's Complete Colloidal Mineral Complex, which doesn't impart any additional flavor but does contain 72 naturally occurring trace minerals. For 10% off your Colloidal Earth purchase, use code Katie10! Or you can try this affordable option from Amazon. I have both! Ultimately, I've noticed an improvement in hydration (especially my skin), in digestion (helps keep you regular which is my constant battle), and my overall energy (here's a study on the effects of just smelling a lemon)! I usually wait 30-45 minutes before consuming any other liquids, allowing time for my lemon water to work its magic. By this point, I'm ready for my matcha! These days less so because I'm tired and more so because I'm hungry, but we'll get to that later. I gave up coffee a while ago, maybe a year or so? I occasionally still drink it but usually only on special occasions, like vacations or epic hangovers (which is every hangover the older I get). I switched to matcha, which has just as much caffeine as a cup of coffee (34mg), tons more antioxidants to fight all those pesky free radicals (and even cancer), and sustains you longer than coffee without all the jitters. By now, you might know me well enough to know that's not all I put in my morning cup of caffeine. I'm known for making a simple thing exponentially more complicated. It's my super power! While I do take some supplements in pill form, I'd rather drink my vitamins. For this reason, I like to add some adaptogenic potions to my matcha, to not only increase health benefits, but also benefit my skin! Terrasoul Superfoods is a brand I love. They make tons of superfood powders, flours, carry coconut in a million forms, plus have dried nuts and berries and even make oils. They are USDA Organic and independently test all their ingredients for contamination. They work directly with farmers and co-ops around the world offering an ethically sourced product. They were kind enough to donate my ingredients to make this post and created a discount code for all of you. Use code KATIE10 for a one time 10% discount on your Terrasoul order, valid till 12/31/18. This traditional Ayurvedic herb is packed with antioxidants. Studies have shown that this herb can play a significant role against several kind of neoplastic growths (cancer) and hence might be used as an alternative to chemotherapeutic treatments. Very cool! It aids in wound healing, boosts estrogen levels which in turn stimulates estrogen's precursor DHEA which stimulates collagen production, and substantially reduces cortisol levels helping to relieve stress (stress = inflammation, inflammation = poor health/aging/degenerative disease). Ashwagandha has an interesting flavor. Thankfully, only 1/3 of a tsp is required per serving. Often referred to as "skin food," Tocos is a rice bran water soluble. It is a fantastic rich source of bio-available vitamin E which is great for your skin and connective tissue, in addition to cardiovascular health. It's fluffy and light, tastes like vanilla ice cream and it's good for your skin?! I add 1-2 heaping tablespoons of this to my morning potion. Did you even know there was more than one? Ceylon Cinnamon is known as the "true" cinnamon. It has better flavor and more health benefits than the traditional Cassia variety. Great for digestive health, it's anti-inflammatory and can even lower blood pressure. He Shou Wu - This traditional liver and kidney tonic gives amazing anti-inflammatory and detoxifying benefits to the skin. Pear Powder - Rich in zinc, magnesium, calcium and iron, pearl powder supports joint and bone health, stimulates collagen, enhances healing and supports skin hydration. Red Reishi - This stress relieving mushroom detoxifies and protects the skin. Cordycepts - In addition to improving cardiovascular health, its anti-aging properties can assist in rejuvenating the skin and support oxygenation of the body. Pine Pollen - This tree pollen is loaded with antioxidants, minerals, is great at hormone balancing and increasing overall immunity. The idea that fats make you fat has long since been disproven. While some fats, specifically trans fats, are indeed bad for you and can increase cholesterol and lead to inflammation, others can actually reduce cholesterol and improve overall health. Don't believe me? Here, even Harvard said so! Adding healthy fats to your caffeine in the morning is a fantastic way to make your caffeine last longer. Instead of getting a big jolt of caffeine right when you drink it, it's processed by the body at the same rate as the fat, slowing down the absorption of caffeine and prolonging its effects (this is great for anyone drinking multiple cups of coffee in the morning). Plus, you get tons of Omegas and other vitamins from the fat itself! Because I also intermittent fast (I don't have my first meal until after noon and stop eating around 8pm), this sustained energy helps me not feel hungry too soon. I do a mixture of organic coconut oil and grass fed ghee, about 1 TBSP in total. Grass Fed Ghee - Ghee is clarified butter, essentially butter that's had the lactose removed. It's full of fat soluble vitamins A, E and K, all important for skin health. It's packed with conjugated linoleic acid (CLA), which releives inflammation, lowers blood pressure and might even help you lose weight. My favorite brand is 4th & Heart. It's creamier than other brands and, I think, tastes better. Because I also cook with ghee, I get the Himalayan Pink Salt Ghee (two birds, one stone). However, they make a Vanilla Bean that's awesome in matcha or coffee. They also make super convenient single serving packets for ghee on the go. Organic Coconut Oil - It’s rich in medium-chain fatty acids, which are easy for your body to digest, not readily stored by the body as fat and small in size, allowing them to infuse cells with energy almost immediately. It's antioxidant benefits make it a great anti-inflammatory. Opt for extra virgin oils since heat during processing can minimize these benefits. 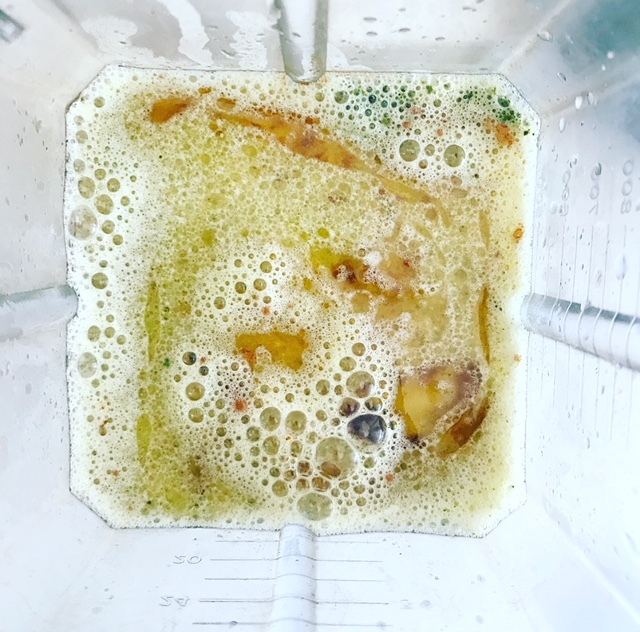 Side note: The addition of fat to your beverage doesn't necessarily make it oily or greasy, if you mix it in a blender. It actually creates this lovely froth and gives your drink a creamy texture. I whip everything up in my VitaMix. It's the most used tool in my kitchen. A million years ago after a family trip to Scotland where we first came across such a device, my mom bought me an electric water kettle. Another kitchen tool I use daily. I make my matcha with a ratio on 2:1 almond milk to water. This makes my almond milk last longer yet keeps the beverage creamy. Add your healthy fats. I add slightly more coconut oil than ghee, about a Tablespoon of fat in total. Add your powders. Shown (clockwise from top) is Cinnamon, Ashwagandha, Matcha and Tocos. Add your milk. I use almond but you can use whatever you'd prefer. When buying nut milks, look for products without added carrageenan or artificial ingredients. Add your sweetener. I add raw honey because of its innumerable skin benefits and it tastes good! We have a giant jar from one of my boyfriend's farmers (one of the many benefits of being a butcher's girlfriend). I was hesitant about including this this fun fact, in fear of offending any vegan subscribers. I'm sorry if I did. But it's the truth. I eat meat, even if it's only grass fed and pasture raised. I live with a butcher, who's committed to whole animal sustainability. Add hot water. I pour water from my electric kettle over the spoon covered in honey, so as to not waste and delicious honey and also save on cleaning time. Then drink it out of a super cute Ben Medansky mug and ENJOY! Disclosure: I'm an esthetician, not a nutritionist or physician. If you're being treated by a physician, ask said physician about incorporating herbs and adaptogens into your diet before you do. I try and link scientific studies whenever applicable so you can decide for yourself if you're pickin' up what I'm puttin' down. Thanks! Also, this is a semi-sponsored post. This post does contain some affiliate links, meaning, at no additional cost to you, I will earn a commission if you click through and make a purchase.